This is a photograph of Speck during the competitive trail challenge in Hartman, Arkansas. 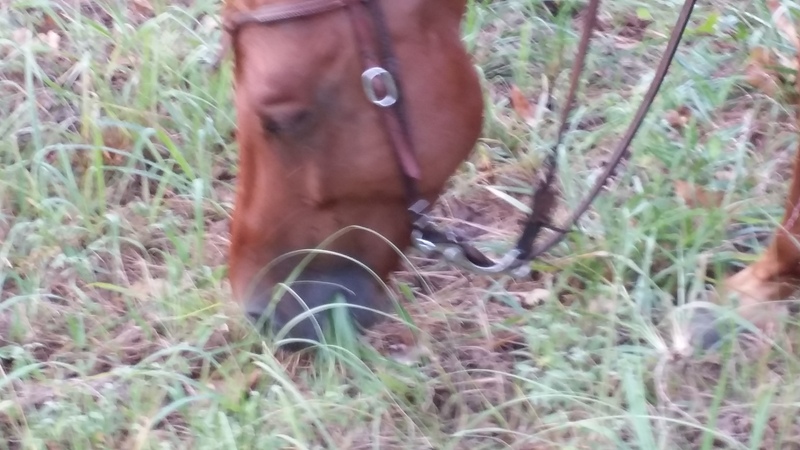 Speck competed in the AQHA and the ACHA challenges with the attitude we hoped to see. Although he was uneasy with the arena during the thunder-storm and many of the strange contraptions such as the mechanical calf moving back and forth, he never displayed any inappropriate behavior. He remained calm, quiet, and pretty much willing. 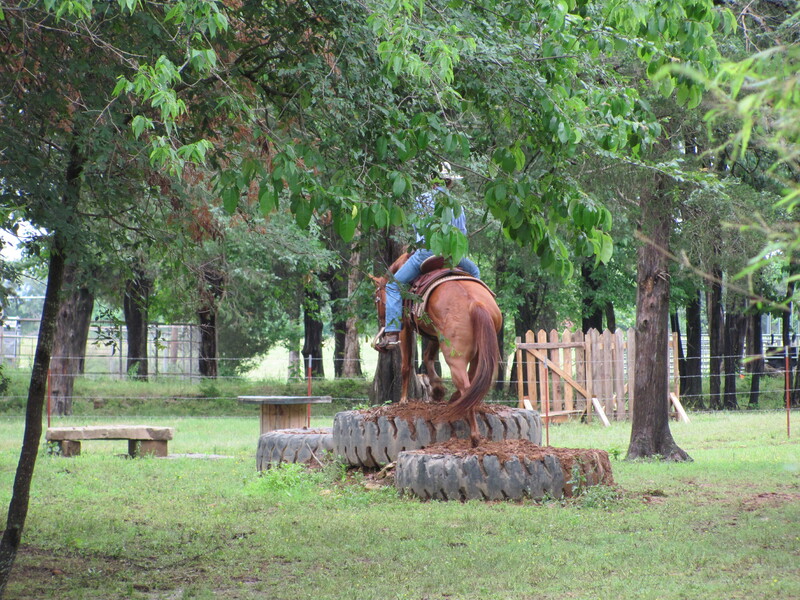 Each new obstacle had a 30 second time limit for the horse to approach, investigate, and overcome. As soon as you finish one obstacle, you immediately go to the next one. 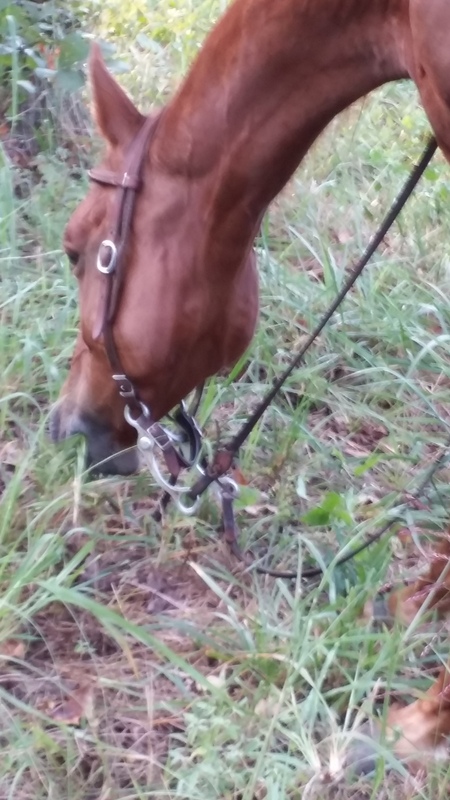 Your horse is seeing 10 -12 new and unusual situations in a row. Many horses refuse some of the obstacles as did Speck. But overall we were satisfied with his demeanor and glad to see his training at work. Speck ended in third place in the novice division and took home a cap, t-shirt, and a training log book. I guess he’s a bit put out over the fact the t-shirt won’t fit him and I wear the cap. Oh well, maybe next time they will have horse size t-shirts. The other obstacles shown in the photograph include the large rock on concrete blocks the horses were expected to climb and go over. It was a little slippery from all the rain and mud, but became increasingly slick after several horses had gone over. The giant spool was the next obstacle and the rider was required to dismount on the spool and then remount before continuing to the tunnel (not shown here). The tunnel was exactly what you would expect, a tunnel made from black plastic the horse was supposed to walk through while the wind was blowing. If you haven’t gone to a competitive challenge, it is really a lot of fun if you have a quiet horse. You can learn a lot from watching other riders and working with your horse in a new environment. The Horsemen of Arkansas were great and made it a spectacular time. 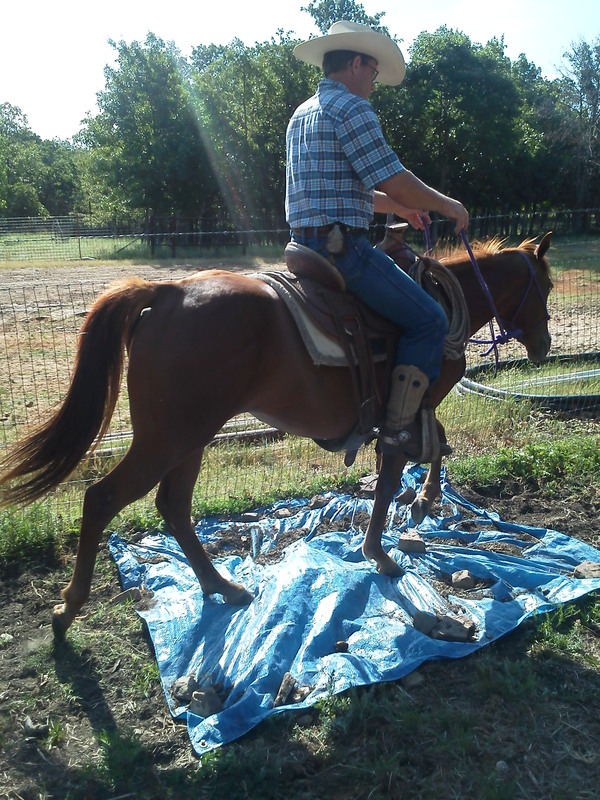 The tips, support, and willingness to help you and your horse succeed made it relaxing and enjoyable. The day was about every horse and rider doing their best with the combined help of all the participants. We highly recommend it. 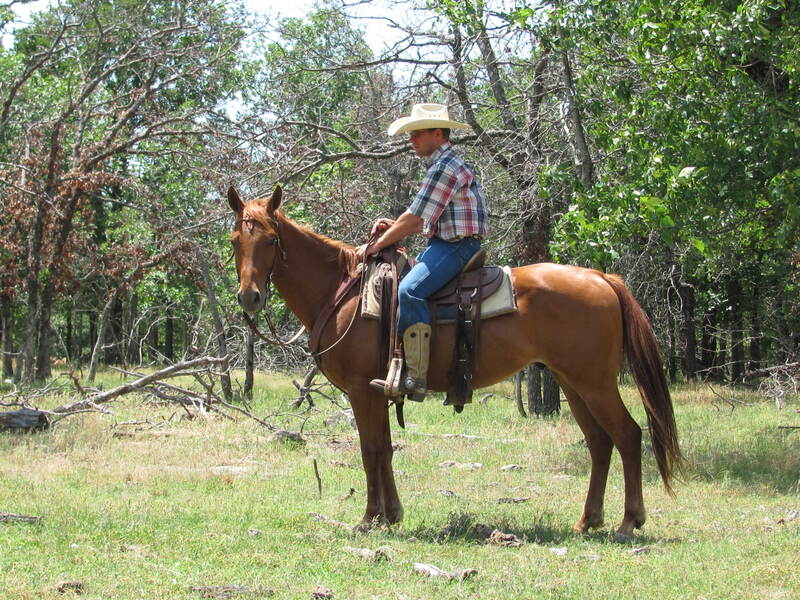 Speck is the perfect example of the quiet nature we like to see in one of our trail horses for sale. He doesn’t get excited about much of anything. The disposition comes from three things. Genetics surely plays a large part. 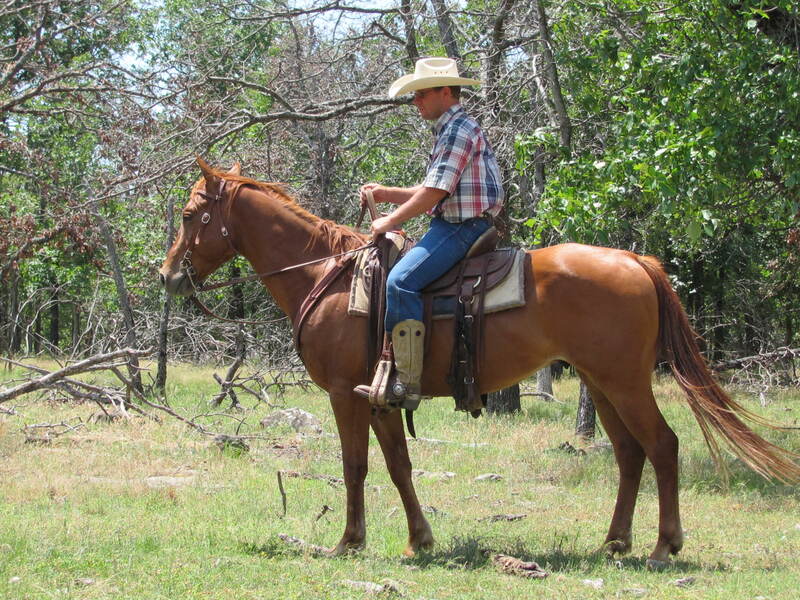 The American Quarter Horse with the foundation blood lines produce nice horses. The training Speck was given used his good genetics and taught him to accept circumstances that would frighten a lot of horses. He has been required to drag tarps, ride with tarps covering him, walk across tarps, bridges, drag logs, pony colts, exposed to tractors, semi-trucks, motorcycles and everything we could throw at him. He has been exposed to sirens, barking dogs, and deer jumping up nearly underneath him. Third,we have been pulling wet blankets off his back for approaching 17 months. While Speck has a little more to complete before graduating the two-year program, he is well on his way. Not long ago he passed umbrella training where he stands still while an umbrella is opened and closed repeatedly and noisily with a rider on him. Speck is going to make someone a really special horse with many, many years of fun and good times! You are currently browsing the archives for the Meet Speck category.